It was almost a year ago when the fishsiam.com team first embarked on a series of exploratory trips in search of the mythical Giant freshwater stingray. My partner and co-owner of our company Wuttichai Khuensuwan ‘Boy’ had told me stories of this legendary fish which was said to lurk in some of the wildest and most unexplored waters in S.E Asia. I had heard tales of local fishermen fighting unseen monsters in epic battles lasting twelve hours only to lose the fish due to inadequate tackle. I have also heard stories of monster rays being hooked with wire cables and extracted by waiting locals with the aid of four wheel drive pick-ups! Many stories exist about this nomadic and elusive giant and it is truly a fish shrouded in mystery and folk lore. Our first expeditions were focused on the Maeklong River in its lower tidal reaches at Samut Songkran.After making exhaustive local enquiries we decided to concentrate on one particular stretch of the river near the town of Amphawa. Adopting a mobile approach using a boat we fished a variety of areas resulting in the capture of a series of Giant freshwater stingray with weights reaching an estimated 80kg with several larger specimens being lost after long protracted battles! During one of our many sessions on the Maeklong River it was agreed that we would visit the Ban Pakong River another of Thailand’s great tidal rivers which was reputed to hold fish of an even larger size!Fishing the Ban Pakong River would see us changing our approach and fishing from the riverbank, with the hookbaits being boated out into the powerful flow before being lowered down to the riverbed. After a few losses in our initial expeditions it was clear that our tackle needed to be upgraded to a stronger more’ industrial’ standard. Flurocarbon hooklengths were exchanged for 180lb wire traces in an effort to capture one of these mythical unseen giants! With our mainline being changed to 100lb powerpro and the introduction of large Shimano TLD multipliers we started to fish the Ban Pakong River in earnest. 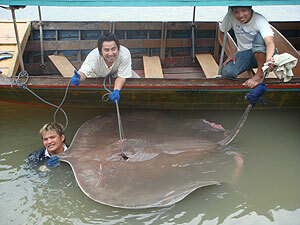 On 26/12/2007 Tom Parker a returning fishsiam.com client would capture what we believe to be the largest documented Giant freshwater stingray ever caught in Asia and possibly the world! After an epic one hour battle Tom aided by the fishsiam team landed the fish of a lifetime which was estimated to weigh in the region of 200kg. The enormous prehistoric predator was recorded as having a wingspan of 240cm and was safely released after capture. These captures would attract worldwide media interest and the attention of the WWF and the Southern Australian Museum. We believe that much larger monsters lurk in the muddy waters of the Ban Pakong River just waiting for anglers with a sense of adventure and pioneering spirit! At the time of writing fishsiam.com have accounted for no less than sixteen individual Giant freshwater stingray from two of Thailand’s wildest and unexplored river systems in a series of short expeditions. Fishsiam.com will be continuing our efforts on these wild and most remote river systems in our continuing quest to catch the largest freshwater fish on the planet! The Giant Freshwater Stingray (himantura Chaophraya) is found in various river systems throughout Thailand and South East Asia. This mythical creature reaches weights exceeding 1,000 lb (450kg+) and is arguably the largest true freshwater fish on the planet! The Giant freshwater Stingray is a highly adept predatory fish easily identifiable by its huge disc-like body and long whip-like tail with larger sized specimens reaching over 4 m in width. The Himantura Chaophraya is the ultimate freshwater predator silently gliding across the bottom devouring all manner of prey items with its cavernous mouth located on its underside. The Giant freshwater stingray has an extremely soft underside displaying a white colouration throughout with a grey to brown colouration on the edges of its disc-shaped belly. Positioned near the base of the creature’s whip-like tail are two highly venomous spines containing toxic venom which can cause great harm and discomfort. Determining the gender of these fish is a relatively easy exercise with the male of the species clearly displaying genitalia at the base of its tail called claspers, the female having a distinct lack of genitalia in this region. These prehistoric predatory fish with ancestory dating way back before the time of man live in some of the wildest and most remote river systems in South East Asia. This highly elusive and mysterious creature is the ultimate freshwater predator and thoroughly deserving of the title ‘The world’s largest freshwater fish’. The Giant Freshwater Stingray is a highly understudied creature with very few documented captures and is classed as vulnerable on the IUCN Red list. The Giant freshwater stingray is present in various river systems throughout Thailand and S.E Asia and is threatened by both industrial and agricultural pollution in addition to the building of dams which block the fish’s migratory routes and possibly disrupt the successful breeding of this mighty prehistoric fish species. Fishing for Giant Freshwater Stingray on a massive tidal river such as the Ban Pakong in Thailand is a daunting prospect. The sheer volume of water the angler is faced with coupled by the ever changing conditions caused by the invading tidal movements from the ‘Gulf of Thailand’ make the Ban Pakong River a truly wild and untamed water. Extremely strong and robust 5ft-6ft stand up rods such as’ Penn tuna sticks’ coupled with large and reliable multipliers such as Shimano TLD 30’s are essential to stand even a chance of landing one of these prehistoric predators! Heavy braided mainlines of at least 100lb are attached to long 130lb fluorocarbon shockleaders of a minimum of 10m’s in length and then secured to 2m hooklengths of 180-250lb wire in an attempt to tame the mighty Giant freshwater stingray! Large 7/ 0 Mustad hooks are then securely crimped onto the wire trace. With the powerful flow that pushes through the river it is advisable to use weights of 500g + to hold bottom out in the middle reaches of the tidal river. Weights are attached either ‘bungee-fashion’ by way of elastic bands onto the leader or with a free running set-up incorporating a free running ring placed onto the mainline to which the weight is attached. The use of a boat is crucial for the placement of baits at distances of upto 400m and is essential in the extraction of a fish once hooked in mid-river. Locally procured livebaits are mounted onto the hook by passing the hook through the baits tail before nicking the hook under the dorsal fin leaving the hook proud for maximum hooking potential! It is advisable to wear a ‘body harness’ whilst playing Giant freshwater stingray to allow the angler the maximum of leverage whilst connected to these mighty predators. In addition a good quality ‘waist gimbal’ is required to help cushion the angler from the powerful displays of strength that the Giant freshwater stingray displays when hooked. Epic battles of several hours in duration are not uncommon if you are fortunate enough to hook one of these prehistoric predatory giants with the fish displaying awesome shows of power and repeatedly clamping onto the muddy riverbed creating an unmovable weight in an attempt to thwart the anglers repeated attempts to bring the fish to the surface! 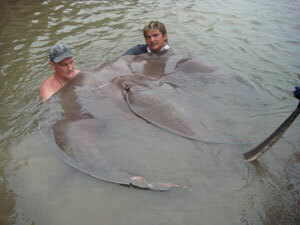 After capture Giant freshwater stingray should be handled with extreme care and only anglers experienced with the handling of this mighty species should attempt such a potentially dangerous operation.Fishsiam.com has perfected techniques allowing the angler and fish the maximum of safety throughout the entire process of catch and release. 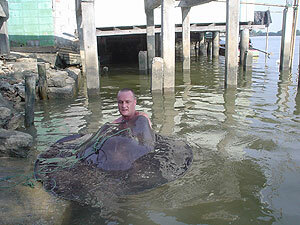 When a Giant freshwater stingray is brought alongside the boat the creature’s tail is quickly brought under control by grasping it firmly at the base carefully avoiding its spines and their venomous contents. Sheer manpower is used to secure the fish with four or five people needed to assist the angler in each capture. A soft but strong nylon rope is then threaded through the creature’s nasal cavity (spiracles) and then secured to the boat, the fish is then taken to shallower water. At the waters edge the spines on the Giant freshwater stingray’s tail are wrapped with a cloth whilst the tail is securely held at all times. The fish is given a short recovery period whilst photographs and measurements are recorded before being safely released. With the vulnerable status afforded this species by the IUCN fishsiam.com make every effort to ensure the fish’s safety and well being during capture and release. Local knowledge is essential if you intend to target these underwater giants in the Ban Pakong River. We have spent many long hours on exploratory trips in search of this highly secretive and nomadic species, searching out potential holding areas and fishing at various locations throughout the river system’s of Thailand. All of our captures of this mighty species can be attributed to the hard work of my partner ‘Wuttichai Khuensuwan’ aka ‘Boy’ and the highly skilled local members of team fishsiam.com whose knowledge has been invaluable in the pursuit of these ancient monsters of the deep!